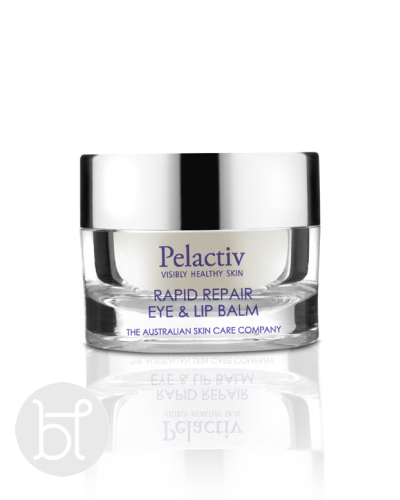 Pelactiv Rapid Repair Eye & Lip Treatment assists in improving skin smoothness and texture, displaying an instant lifting and smoothing effect surrounding the eye area. Australian Made. A rich, luxurious eye and lip treatment specifically formulated to improve the appearance of skin texture and firmness, surrounding the delicate eye area. Formulated using a unique combination of Laminixyl – a laminin-5 peptide designed to enhance skin integrity and function through the dermal-epidermal junction, and Suberlift to create a visible tightening effect on the skin therefore reducing the appearance of premature ageing. Rapid Repair Eye & Lip Treatment assists in improving skin smoothness and texture, displaying an instant lifting and smoothing effect surrounding the eye area. APPLICATION : Scoop out a pearl sized amount with spatula. Use morning and night to protect and nourish the delicate skin surrounding the eye and on the lips. Apply any time of the day or night when your skin is feeling particularly dry. Laminixyl TM Enhances skin integrity and function by increasing dermal adhesion through the dermal-epidermal junction. Suberlift TM Contains the active ingredient suberin. Tightening effect. Vitamins C & E Antioxidant properties, environmental protection and skin strengthening.